COACHBUILD.com - Bugatti Mulsanne / Bentley Galibier ? 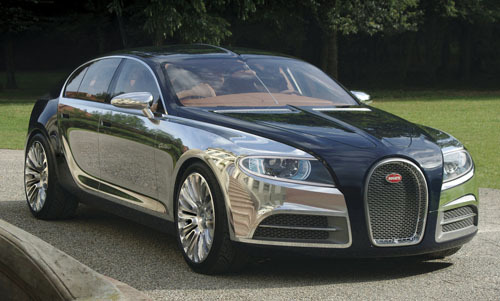 Bugatti Mulsanne / Bentley Galibier ? Bugatti Automobiles S.A.S. 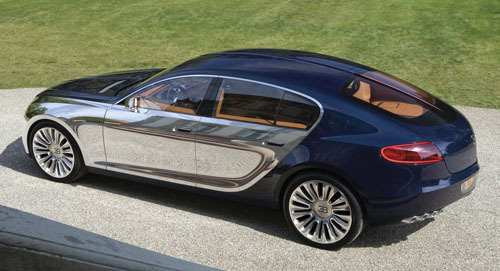 presented customers with the "all new" Bentley...ehr... Bugatti 16C Galibier concept. What the...?! Has Bugatti become a coachbuilder now? After a long period of teasing and speculating, Bugatti finally took the cloth off their new four-door supercar concept. The new Bugatti Galibier shares the same powerplant as it’s counterpart Veyron: a 16-cylinder, 8-litre engine with two stage supercharging. One of the Galibier's most eye-catching features is undoubtedly the two-tone outer skin, which is comprised of both polished aluminum for the doors and front fenders and a dark blue carbon fibre weave that shines through. Bugatti states in their press release: "The Galibier’s design masters the challenge of uniting sportiness with the comfort and elegance of a modern four-door saloon." Oh yes, it is a nice car, but please have a close look. Of course, all the typical Bugatti styling elements are there, but does this car, apart from the badging, really say Bugatti to you? This is what Bugatti says about the exterior: "With the typical Bugatti radiator grille, big round LED headlights and the clamshell running the length of the vehicle which became synonymous with the brand identity under Jean Bugatti in the Type 57, this car transports the Bugatti genes into the modern world." Now have a closer look, please. You see? It suspiciously looks like they took a Bentley Mulsanne, fitted the larger VAG W16 engine and rebodied the car "Bugatti-style" with a fastback rear end. As you can see in the image below, all the hard points of the Mulsanne's chassis remained. The waist line and the bonnet near the windscreen have the exact same dimensions as the Bentley does and I expect the same goes for the roof. The lower part of the A-pillars, the B-pillars and the narrow window guiding pillars in the rear doors are identical. This is platform sharing to the max! What Bugatti genes is Bugatti S.A.S. talking about? 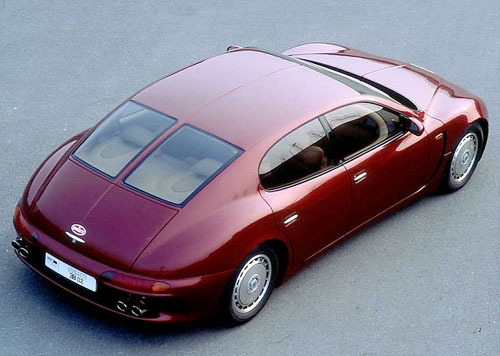 The Galibier has become a mix of the 2002 Volkswagen D1 - a fastback concept which eventually became the Volkswagen Phaeton - and the Bentley Mulsanne with a lot of cliché retro Bugatti elements. When we said "Please, coachbuild this!" in an earlier article about the not so good looking Mulsanne, we didn't mean for Bugatti to actually do this. I know the Galibier is only 'just' a concept, but unfortunately things do not look very promising for the Bugattist Pur Sang. I mean - what is there to love? Are there any true Bugatti genes left? Ettore Bugatti always referred to the Le Mans Bentleys - Bugatti's arch rivals - as being big and heavy trucks. Ettore fought these trucks with very lightweigth, agile and efficient machines and now look what Volkswagen did to Ettore's and Jean's legacy... A coachbuilt Bentley with the sacred Bugatti badge, for heaven's sake! Please, stop this sacrilege of turning this noble brand into a coachbuilder for German British-labeled-Beetle-derived TRUCKS. Volkswagen should have consulted Giugiaro's ItalDesign. This design/coachbuilding company has proven to do a much better job in the quite recent past. To end with a positive note; the Galibier's interior looks pretty nice.